After 80 scoreless minutes of regulation play and another 16 in overtime, everybody knew that Tuesday's Clackamas at West Linn girls soccer game was headed to penalty kicks. The Lions were whistled for a foul with 3 minutes, 43 seconds left in the second half of overtime, junior forward Kyla Sullivan stepped forward to convert the ensuing penalty kick and the Cavaliers walked off with a stunning 1-0 upset win in the Class 6A state semifinals at West Linn High School. "Oh my God, it's so awesome. It was so nerve-racking," Sullivan said. "This was probably the most evenly matched game, and I don't know how the championship is going to go, but this one felt like winning the championship." "I think it's just amazing that (Sullivan has) finally gotten her time to shine and just shown what she can do," said Clackamas senior defender Kori Walters. "It was 'Oh Jesus. Please let this go in.' I cannot express the knots my stomach was in and the anxiety I had and we were all just praying that it would go the way it needed to." Sullivan's goal not only gave third-seeded Clackamas its 13th straight win, it also sent the Cavaliers into the Class 6A state championship game against top-ranked Jesuit (18-0-0) at Hillsboro Stadium on Saturday. Clackamas has reached the title game just once before, falling 2-0 to Thurston in 2012. "I think it will just take the same intensity that we brought tonight," Walters said. "I think that, as a team, we've been preparing for this the entire season because one of our goals — we only had three and one of them was to win state — so we've been preparing for this exact matchup all season and I think we're more prepared than a lot of people would expect us to be." "It's an amazing opportunity," Sullivan added. "It will take playing twice as hard as we did tonight to beat a team like that." With the win, the Mt. Hood Conference-champion Cavaliers improved to 15-2-1 overall and also avenged a 4-0 loss to the Lions on Sept. 17. No. 2 West Linn, meanwhile, saw its 15-game winning streak snapped and ended its 2018 season with a 16-1-1 overall record after going unbeaten to win the Three Rivers League. While the Lions were devastated by the loss, they also knew how much they'd accomplished in 2018 and they knew exactly how they'd done it in head coach Lauren Pyrch's second season. "I think we had a lot more love for each other and we were a lot closer this year than we were last year," said West Linn senior defender Rae Peters. "It made us just want to work that much harder to get the wins for each other and make each other look good and we pushed each other and I think that's what made us successful." 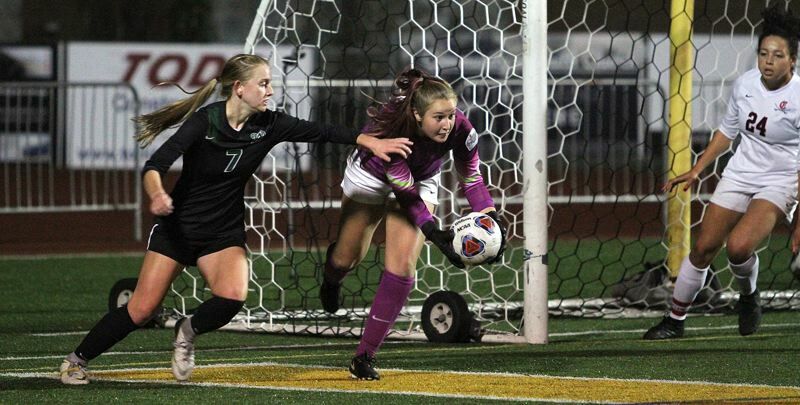 "We have a packed bench, we have people dying to play, we are all working hard for each other and there's just positivity everywhere," said West Linn senior goalkeeper Alyx Burkhartzmeyer. While neither team scored until the second 10-minute half of overtime, it wasn't for lack of opportunity. The Lions held the upper hand in the game's first 15 minutes, getting three shots on goal against Clackamas senior keeper Hallie Byzewski, including a 38-yard free kick from senior midfielder Calli Masters that forced Byzewski to leap and trap the ball against the underside of the crossbar for the save. The Cavaliers rallied after that, however, and took control in the remaining 25 minutes. But like West Linn, Clackamas failed to score, managing just two shots on goal in the half, the best of those a corner kick by senior forward Madeline Tetz that Burkhartzmeyer stopped with four minutes remaining before halftime. The Lions held the upper hand in possession most of the way in the second half and created two more dangerous scoring chances. The first of those came when Peters made a run down the right seam, beat a Clackamas defender and missed just over the crossbar six minutes into the half. The second of those chances came with 21 minutes remaining in regulation when junior defender Grace Winjum passed the ball up the right side to Peters, who took one touch to her left, missed high over the Cavaliers' crossbar again and the two teams went into overtime tied at 0-0. The first half of OT was uneventful — it included a miss by Clackamas' Sullivan and a miss by West Linn's Peters — and the two teams rolled into the final 10 minutes. There, Sullivan had one shot stopped easily by Burkhartzmeyer with six minutes left and she missed another with four minutes to go. But then, Clackamas sophomore midfielder Aidan Brown chased down a pass at the top of the West Linn penalty box and Burkhartzmeyer raced out to challenge. Burkhartzmeyer went after the ball, Brown tumbled to the turf and the center referee called a foul and awarded Clackamas a penalty kick. Sullivan made the chance count, sending her shot to the left post to beat the diving Burkhartzmeyer for the game-winner. "Two games ago against Oregon City, that was my first PK in a game ever," Sullivan said, adding that after her goal, "I think I jumped so high that I hit my chin on my knee." "She's never been bad at PKs — it was always just circumstantial," Walters said. "She's always been on really amazing teams where there were just other players who are also good at putting it in." On their side, the Lions questioned the legitimacy of the officials' decisive call. "I dove for the ball and she jumped over my arms. I would not try to take her out," Burkhartzmeyer said. "I don't know why you think you can change the entire fate of a game in the last four minutes and ruin all the hard work that we put in all year." "Before overtime, if that game had gone, like, five minutes longer, I knew we were going to put one in," Peters said. "We were getting the chances and you could just feel that everybody out there just wanted it so bad and it was just an unfortunate call."